Browse though Creative Cakes list of quality links. The links below include the following topics: party planning, cake recipes, wedding cakes, cake related articles, cake decorating tips and LOTS more. We offer quality Jumping Castles, Water Slides and Gladiators. Our customers have seen the delight on their kids faces when choosing our rental products. www.kidscom.com - KidsCom has kids games, chat rooms for kids, video game cheats and other child activities. Our kids' games focus on fun, learning and Internet safety. Renting or manufacturing of jumping castle inflatable equipment. Jumping Castles themes available like Barbie, Spiderman and John Cena. Contact us for Inflatable Jumping Castles. www.parentstalk.com - ParentsTalk is an online parenting magazine with parenting advice, family activities, parenting information and parent experts. www.kidsonline.co.za - Online directory for baby & children's products & services including pregnancy, baby clothing, nursery decor, toys, practical stuff, party venues & caterers, day trips, child care, activities as well as useful contacts. 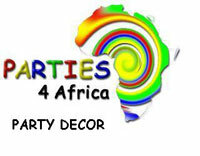 www.parties4africa.com - Parties4Africa has over 5000 products to make your occassion memorable.